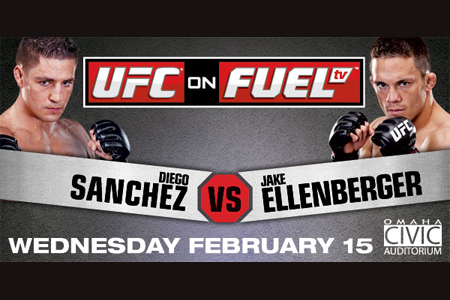 “UFC on FUEL TV: Sanchez vs. Ellenberger” goes down February 15th inside the CenturyLink Center in Omaha, Nebraska. UFC Fight Club members will have the opportunity to purchase seats for the show today at 11AM ET/8AM PT. The general public will have access to the remains on Friday, January 6th at 11AM ET/8AM PT via Ticketmaster.com. A pivotal welterweight scrap between Diego Sanchez and Jake Ellenberger headlines the FUEL TV broadcast.